For Ohio State students and alumni, purchasing a bottle of a red blend or sauvignon blanc can potentially aid in financially supporting a future Buckeye’s college career. 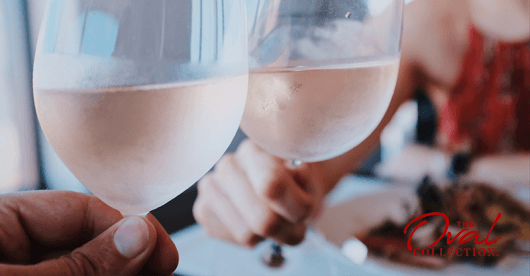 The Ohio State University Alumni Association launched an alumni wine program in 2017 called “The Oval Collection” to support current students with the Ohio State Alumni Association Scholarship fund. In the second year of the wine program, the collection features the following wines: a 2015 Goldschmidt Cabernet Sauvignon, a 2012 Nimble Red Blend, a 2017 Rancheria Chardonnay, a 2017 Versailles Buckeye Blush, a 2013 Mayacamas Red Blend and a 2016 Brutocao Sauvignon Blanc. The deciding factor of which wines would be showcased in this year’s collection, according to the alumni association, was based on taste, price point and connections to the Buckeye community. Located in Versailles, Ohio, The Winery of Versailles bottled the Buckeye Blush, a local blend of Vidal Blanc and Chambourcin. The goal is to continue expanding partnerships with Ohio wineries and alumni-owned wineries in the years to come, Caterinicchia said. Tess Green, Ohio State alumna, purchased the Buckeye Blush and the Sauvignon Blanc this year to share the wine with others and to display the bottle as a memento of her time on campus. “One of the featured buildings on a bottle was Orton Hall where I spent a lot of time while I was in school, and I loved having something that combined my love for Ohio State and Orton Hall with a wine bottle,” Green said. This year’s bottles include labels of campus landmarks such as Thompson Library, Mirror Lake, University Hall and the Armory, formerly a campus activity building located in the current home of the Wexner Center for the Arts. Individual bottles range in price from $10 to $50. With a collaboration with VinoShipper, bottles are available for purchase at the program website, theovalcollection.com/.